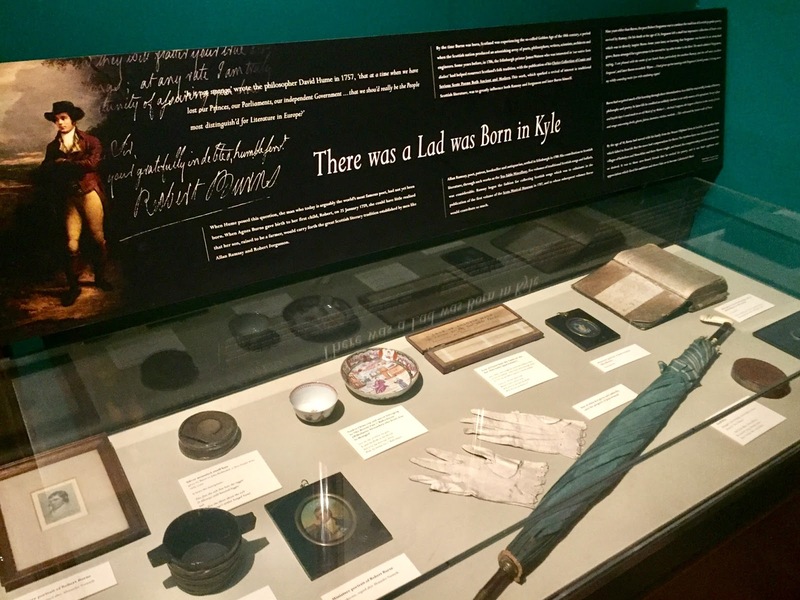 Edinburgh is a city with a rich literary history, with many writers having been born here or spending much of their literary careers. The city's eclectic streets and fascinating history have inspired countless tales, to the point where Edinburgh was declared a UNESCO City of Literature in 2004, the first in the world, and the start of the Creative Cities Network, which now includes over 100 cities worldwide. As such, it seems fitting that one of Edinburgh's best free museums would be dedicated to some of its most notable writers. 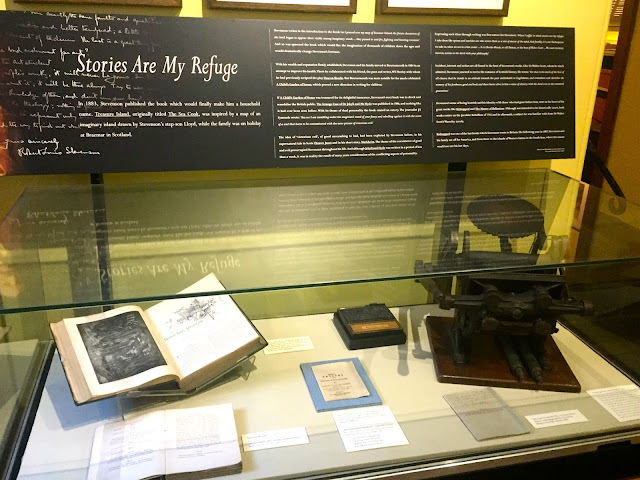 Despite having studied a literature degree while at Edinburgh University, I had never been to the Writer's Museum before, so I finally paid a visit on a spare afternoon off last week. The Museum is in Lady Stair's House, down one of the closes leading off the Royal Mile, and which opens into Makar's Court. 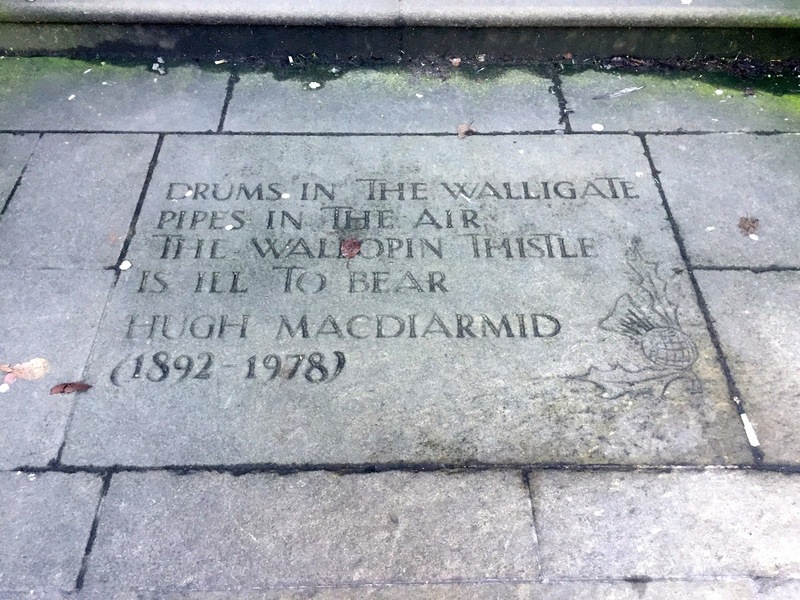 The courtyard is worth paying attention to as well, as there are flagstones laid into the ground, in celebration of other writers, with quotes by them in English, Scots, Latin, and Gaelic. 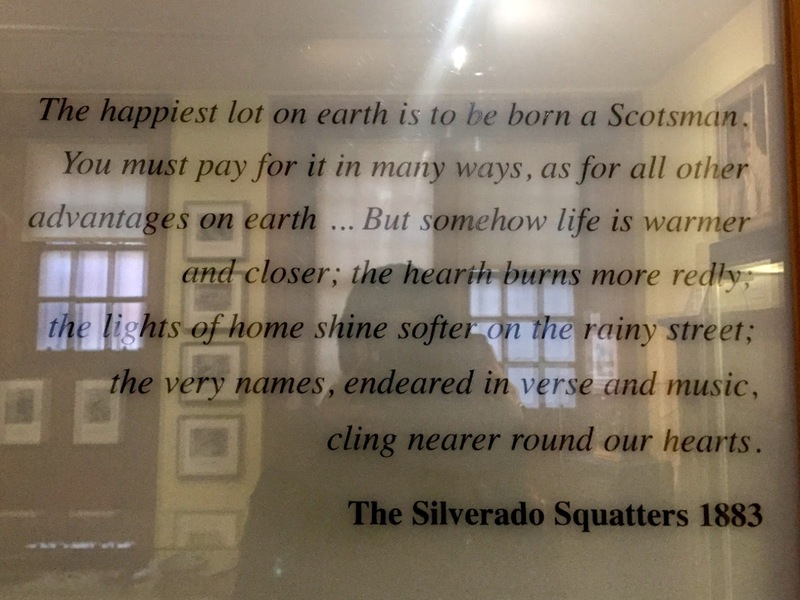 The Museum itself features three of Scotland's most famous writers, Sir Walter Scott, Robert Burns, and Robert Louis Stevenson - by a fortunate coincidence that I hadn't realised at first, I was visiting on Burns Day, the anniversary of Robert Burns's birthday! I started downstairs first, in the Stevenson rooms. 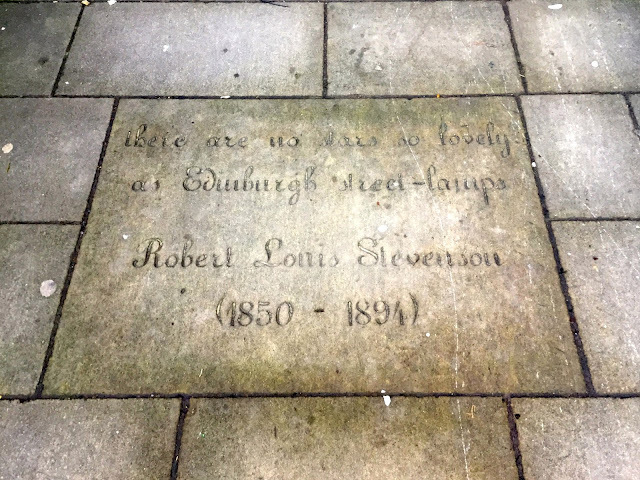 Stevenson was born in Edinburgh in the 19th century, making him the latest of these three writers. 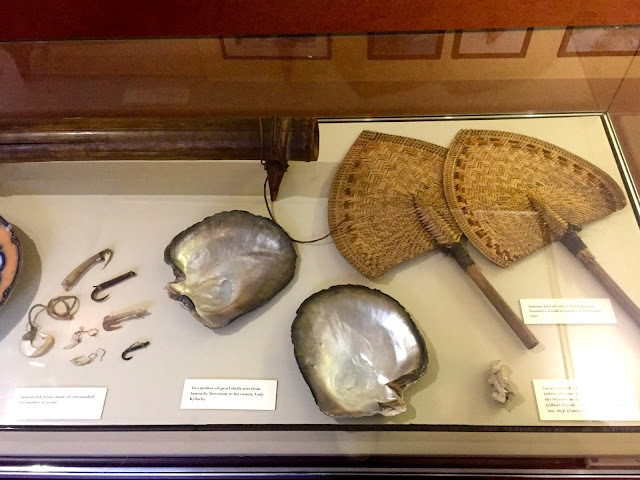 He also travelled extensively, firstly around Europe, and later to the States, where he married his wife, Fanny, and to many Pacific Islands, eventually settling with his family in Samoa, where he died suddenly in his 40s. 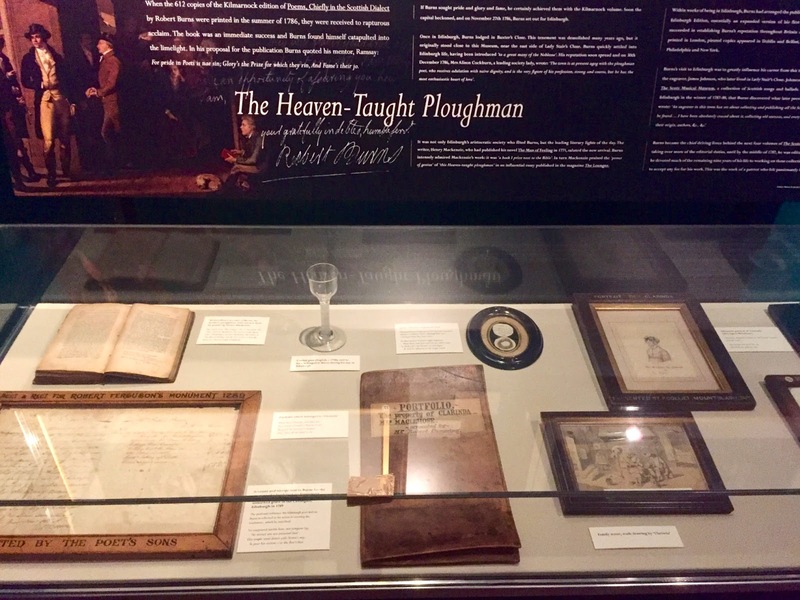 Many of his novels were inspired by these travels, including 'An Inland Voyage', 'Travels with a Donkey in the Cévennes', and two of his most famous novels, 'Treasure Island' and 'Kidnapped'. Possibly his most successful story was 'The Strange Case of Dr Jeyll and Mr Hyde', which caused quite a sensation when it was pubslihed, due to its innovative and dark storyline. It was actually inspired by an Edinburgh man, Deacon Brodie; there is now a tavern named after him on the Royal Mile. 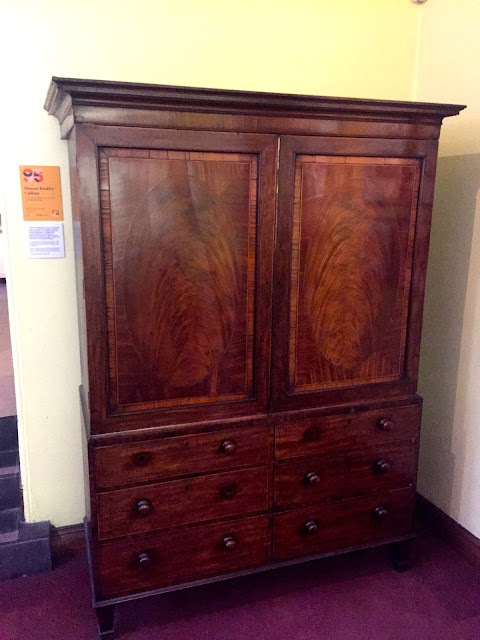 He was a cabinet maker by day, well known and trusted in the community, and made furniture for many wealthy locals. 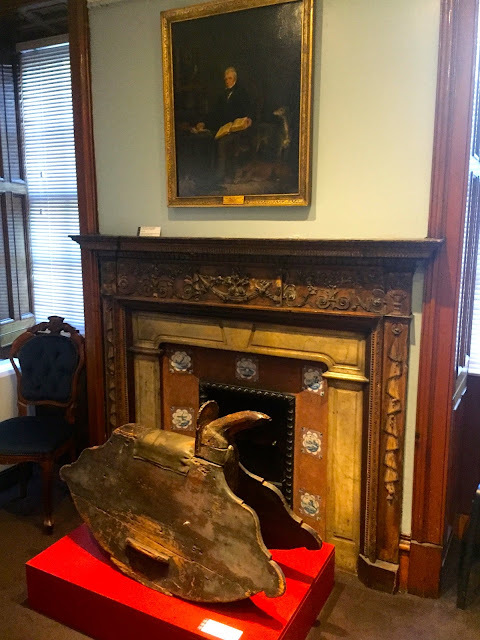 But by night, he used copies of his client's keys to reenter their homes and steal from them, to fund his gambling and drinking habits, and support his two mistresses, and many illegitimate children. He continued to do this for 20 years, before he was eventually caught and sentenced to death, hung on the gallows near St Giles', which he had built himself. The Stevenson rooms in the museum include a wardrobe that Deacon Brodie had made for Stevenson. There are also many photographs of Stevenson, throughout his childhood and his travels, especially his life in Samoa. Other personal items include his riding boots, a pipe, a fishing rod, and Samoan fans, fish hooks, and mother-of-pearl shells, as well as letters he wrote and early editions of some of his novels. I haven't read much of Stevenson's work so far, but seeing all these items and photographs from his travels makes me more interested in doing so, especially having travelled so much myself now. I continued upstairs, where the entrance hall has busts of the three writers, a tapestry featuring their portraits, a model of the Scott Monument - which is very interesting to see, with all the carved figures more easily visible than on the real thing, which is huge! - and a small gift shop. On this floor, are the Burns rooms, tucked in the back. 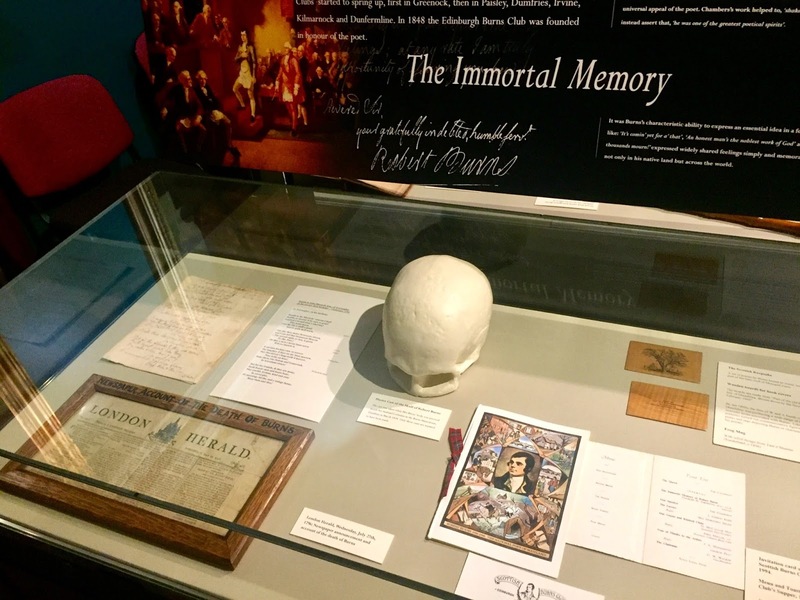 Burns is known as The Bard of Scotland, for the huge collection of poetry he wrote in his short life, and for his efforts in preserving traditional Scottish songs - it's unclear which he wrote himself, and which he collected. Born in Ayrshire, the son of a farmer, he didn't get an expensive education, but was naturally gifted with words. He lived in Edinburgh as an adult for many years, where his poetry was a hit with the literary elite of the time, before moving to Dumfries, where he died aged just 37. He lived in the 18th century, and was a pioneer of the Romantic movement, and also wrote mainly in the Scots dialect. His most famous works include 'Auld Lang Syne', 'Tam O'Shanter', 'A Red, Red Rose', 'Scots Wha Hae', 'To a Mouse', and 'Ae Fond Kiss'. On Burns Night, as it was that day, the Scots celebrate him by hosting Burns Suppers, where we dine on the traditional haggis, neeps (turnips), and tatties (mashed potato), and recite his poetry and songs, as well as make toasts to The Bard, and to the company in the room. 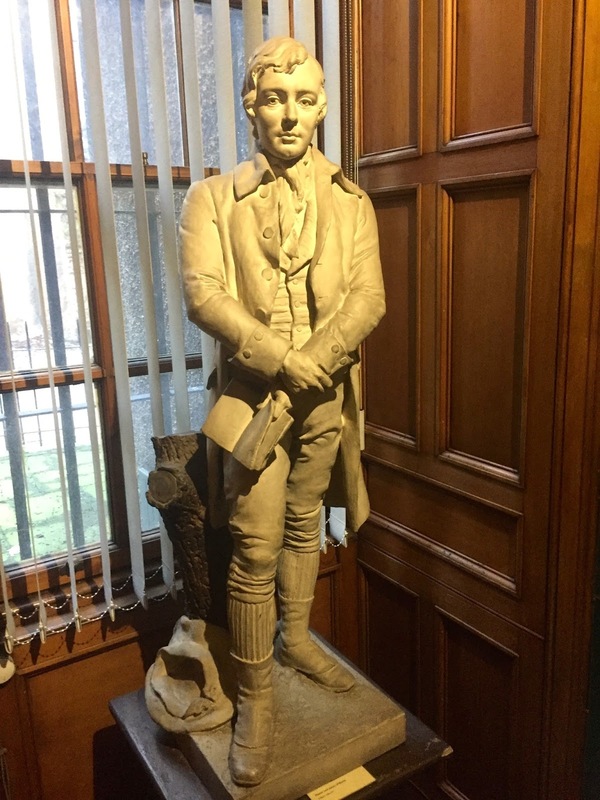 In the Museum, there were numerous statues and portraits of Burns, as well as of many of the significant women in his life (he was known for being quite the ladies man, and penning many romantic poems for them). There are many of his letters, and editions of his work as well, and a newspaper clipping about his death. 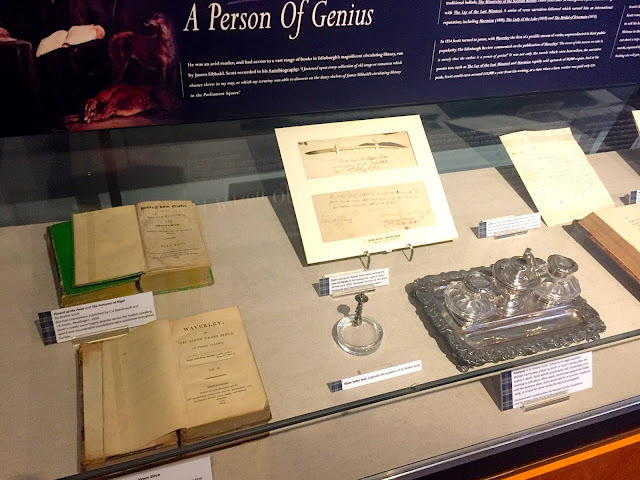 Some of his personal items include a cast of his skull, and his writing desk. 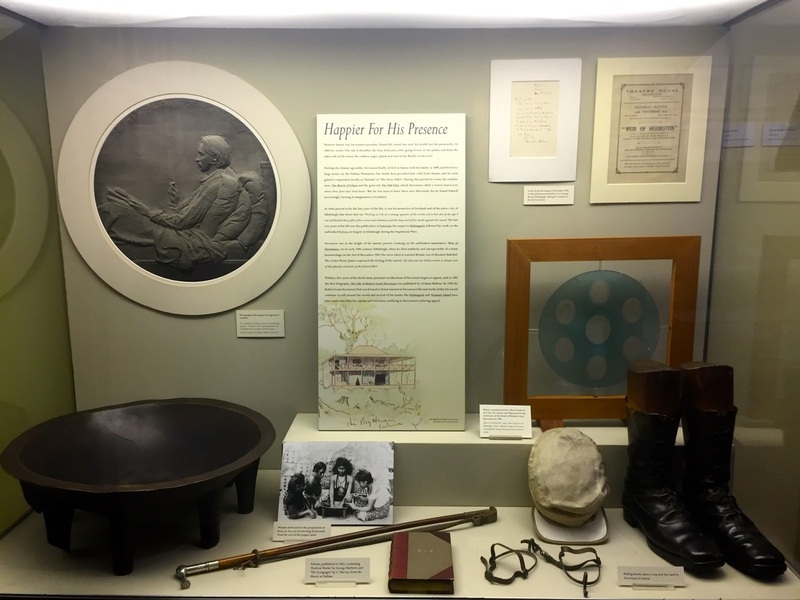 There's also audio recording of his poetry and songs that play in the room, to allow people to get the full experience of his work. 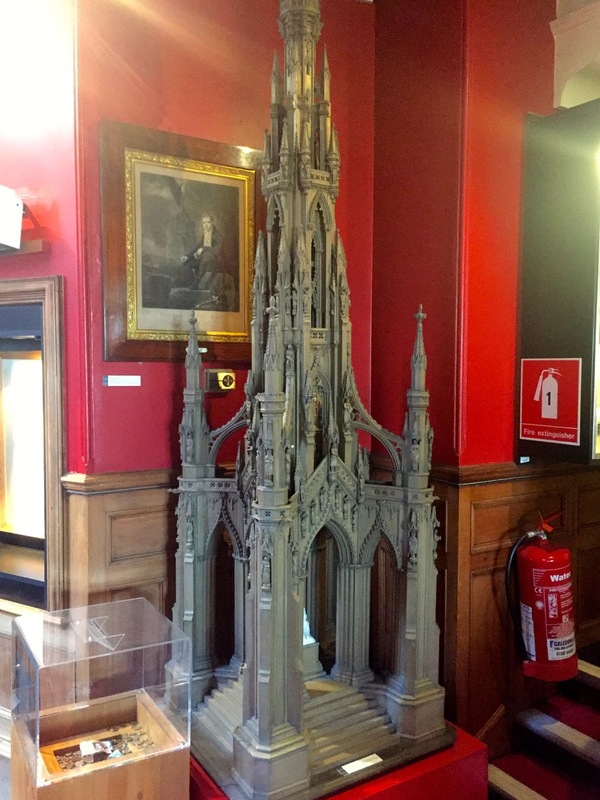 Finally, upstairs are the rooms dedicated to Sir Walter Scott. Scott was a writer so famous during his life in the late 18th and early 19th century, that after his death, the Scott Monument on Princes Street was built in dedication to him. Edinburgh's train station, Waverley, is named after one of his novels, and you can also visit his former home in the Borders, Abbotsford House. He is considered to be the inventor of historic fiction, with many of his novels set during the Jacobite risings. 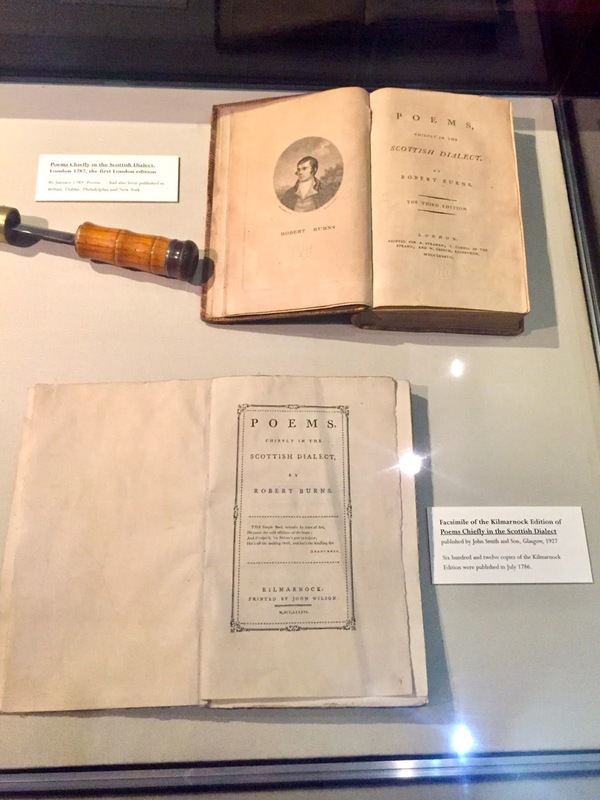 He wrote in both English and Scots, and also had some volumes of poetry published. His most famous works include 'Waverley', 'Ivanhoe', 'Rob Roy', 'The Heart of Midlothian', and the poem 'The Lady of the Lake'. 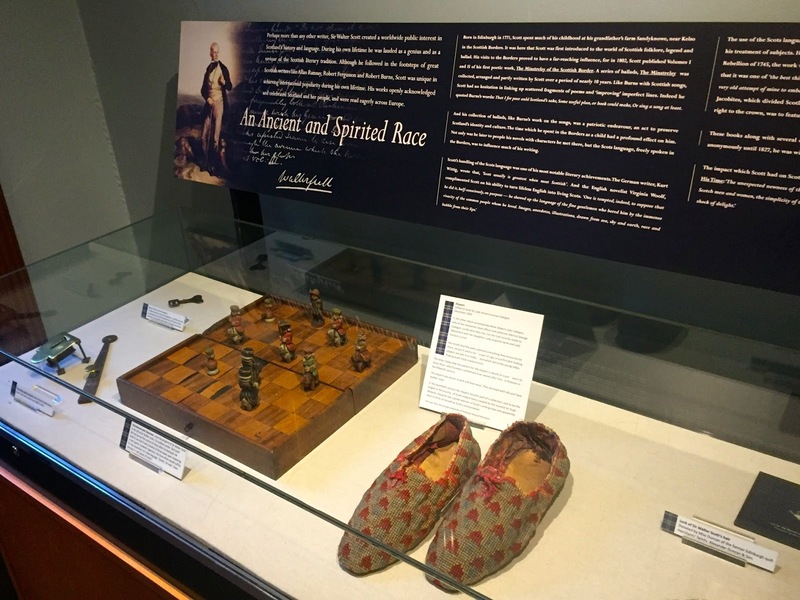 The museum has items including a rocking horse from Scott's childhood home, his old chess set, a pair of slippers, and a walking stick (he had a lifelong limp, due to polio as a child). There are also illustrations from the Waverley novels, and early editions of them, as well as a quill and letters of his. 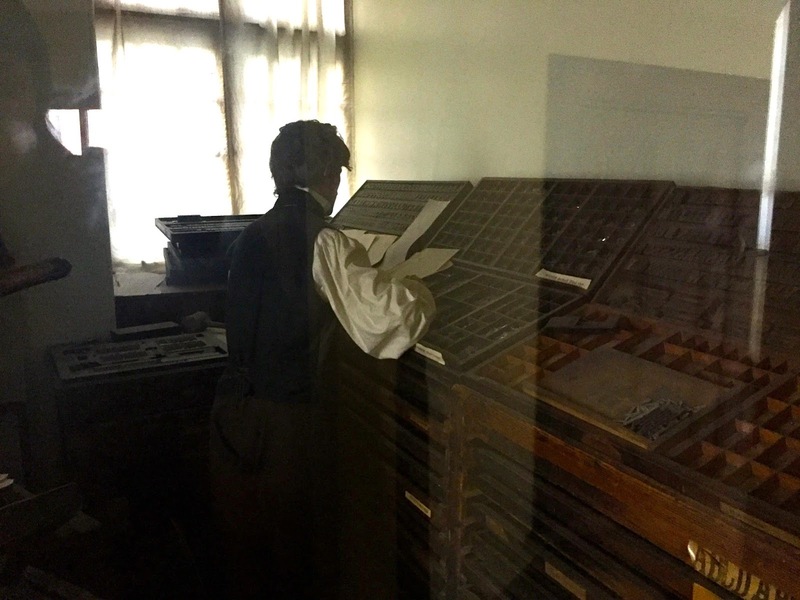 In the highest level of the museum there is a replica of the Ballantyne Press, run by Scott's friend, James Ballantyne, who first set up his business in Kelso, and printed Scott's 'Minstrelsy of the Scottish Border'. He later moved the business to Edinburgh, and printed many of Scott's novels. Like Stevenson, I have read limited amounts of Scott's work - Burns is my favourite of the three, though there are still plenty of his poems I've yet to read - but seeing these items from his life, and the importance of his work within Edinburgh, and Scotland's, literary heritage makes me want to try to read more of his novels. And then, just as I was about to leave, the museum's Burns Day celebrations began, which I was unaware were happening. Two men had set up in the main gallery, with a fiddle and a guitar, to play some of Burns's songs, though only the melodies, as they didn't have anyone to sing with them. They recited some of his poems and songs too. 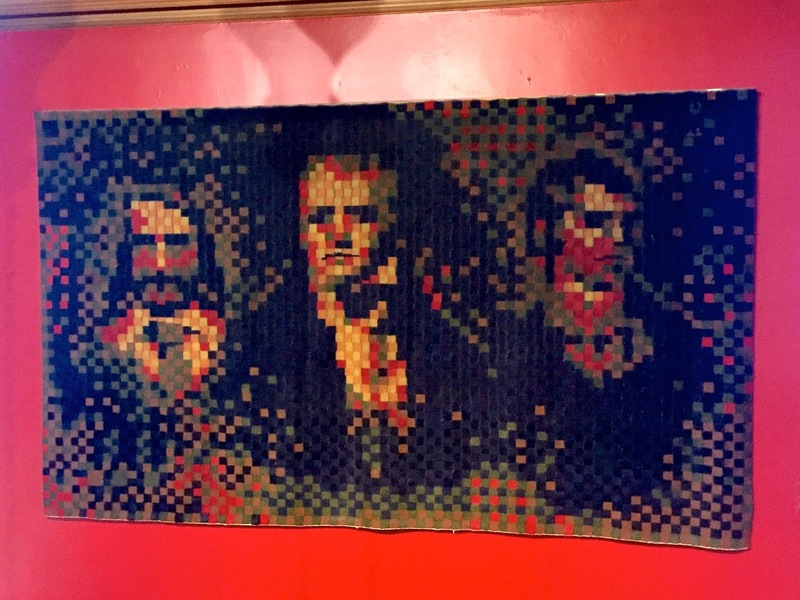 Having been abroad for the last few years, it's been a long time since I've heard Burns poetry and songs aloud, so I was pleasantly surprised to be able to witness this little event! I didn't stay for the whole thing, as I didn't know how long it went on for, but I stuck around for several songs and poems, some of which were less familiar to me, and was certainly glad I did so! Filming wasn't allowed, so I can't show anything from it here, but that was also nice, as it preserved the oral tradition, since there was certainly no filming in the 18th century! The Writer's Museum is an interesting way to spend a couple of hours (and is free! ), whether you're familiar with these writers or not. I think I enjoyed it since I am familiar with them, and they formed an important part of my education in my chosen degree, and it was fascinating to see their belonging or samples of their original handwriting. I think it would still be of interest to others though, to perhaps introduce you to their stories, since it certainly made me want to read more of their work now!